SDP provides an extra layer of security. 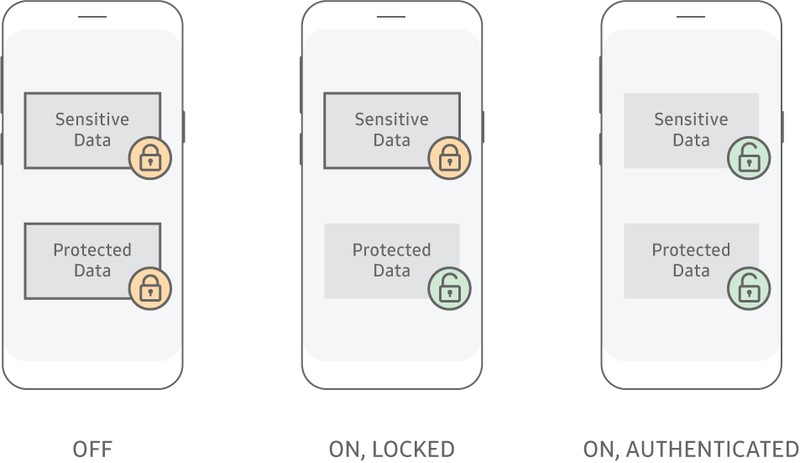 Unlike Protected Data, Sensitive Data remains encrypted, even after the device boots. Data is decrypted only after the device is unlocked through user authentication. SDP data can't be decrypted in the locked state, only in the unlocked state. The SDP data decryption key is also tied to device hardware, meaning Sensitive Data is recoverable only on the same device and only after successful user authentication. SDP enables both app developers and enterprise IT admins to label data as “sensitive” to guarantee the data is encrypted and not accessible on locked devices. Other KPE features, see the KPE White Paper. Other Knox solutions, see the Knox IT Solutions.